A lot of different things can cause cats to behave in a scared manner. If you are around a cat who seems to be unusually timid and wary of human beings as a whole, don't simply dismiss the poor thing as being "paranoid." Scared cats usually have zero to little socialization with people, or have endured especially negative experiences while around them. 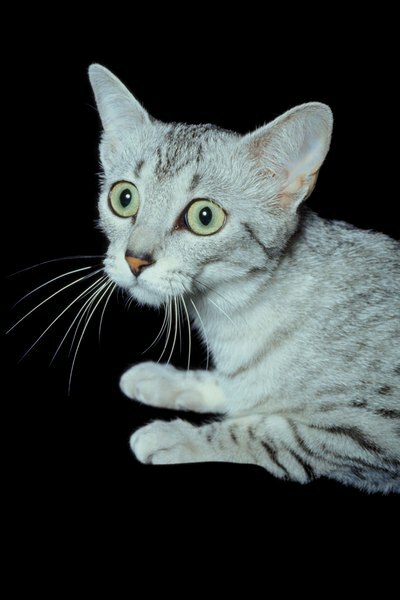 A cat who seems irrationally scared of you may be that way due to lack of socialization. If she was born outdoors and has had very little experience and contact with people, then she may be "feral" or "wild." Her fear of people likely comes from the pure unfamiliarity. It is very hard to get a feral cat to trust a person, and sometimes is actually close to impossible. When it does work, it often takes months or even years to build the necessary trust. Feral cats often display fear through hiding, dashing away at the first sight of a person, crouching down, absent vocalization and nonexistent eye contact. A seemingly paranoid cat may also seem that way as a result of traumatic experiences in his life, whether he was physically beaten by a previous owner or abandoned onto the mean streets to fend for himself. If this is the case for a specific cat, with some time, love and effort you may just be able to get the poor cutie back on track to comfort and happiness. Some cats may behave in a frightened manner because they were simply born like that. The San Francisco SPCA indicates that certain cats genetically may be more susceptible to exhibiting fearful and shy behavioral traits -- nothing more, nothing less. If you raised a cat from her wee kitten days up into adulthood and she still has a tendency to behave with elements of mistrust and fear, it may just be part of her natural character. If you are prepared to put the time into getting a scared cat to come out of her shell, certain behaviors and actions may make the process easier. Firstly, encouraging a cat to link the sight of you with something good -- like yummy treats -- may be a smart start. Work on establishing a strong and positive connection to your cat by encouraging her to associate your presence with something she loves -- and not many cats, if any, don't love food. It's also important to take things slow. Never force your timid kitty to do anything. If she is so inclined, allow her to approach you. Just show your pet that you're a calm person who isn't going to bother or harm her. Part of that involves speaking in a soft, quiet voice and walking slowly -- absolutely no abrupt and sudden movements. Lastly, playtime may be an effective bonding tool for you and your cutie. Whether you use a dangling bird or laser pointer, the point is to spend time with your cat and establish a trusting and tough bond. Time, and plenty of it, is key to eliminating a cat's "paranoid" temperament. In some cases, a cat's fearful behavior may actually be related to health problems. When a cat seems especially jumpy, distant or cautious, it may actually be because she's not doing too well in the health department and is either in serious discomfort or pain. Before making any assumptions about what's going on with your pet, get her to the veterinarian to make sure everything is just A-OK.